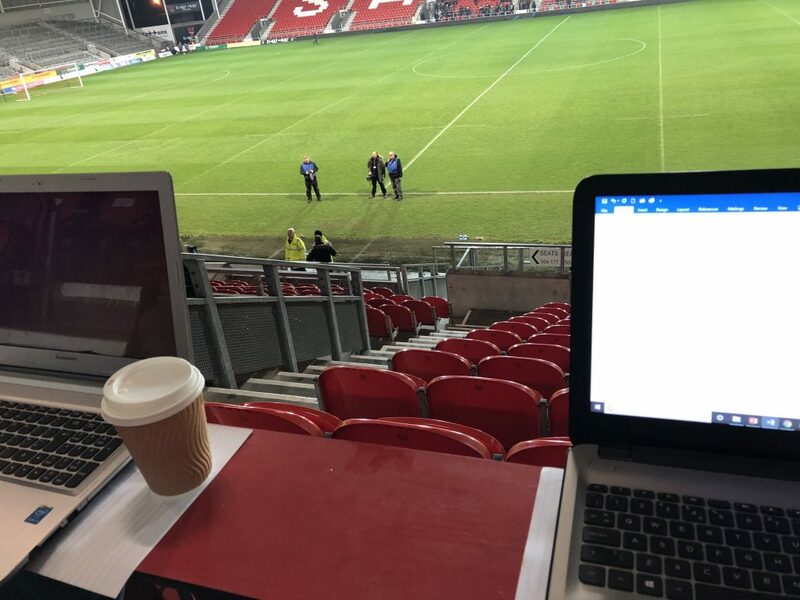 First year University of Chester BA Sports Journalism students traded the classroom for the press box to cover Liverpool’s FA Youth Cup encounter with Accrington Stanley. 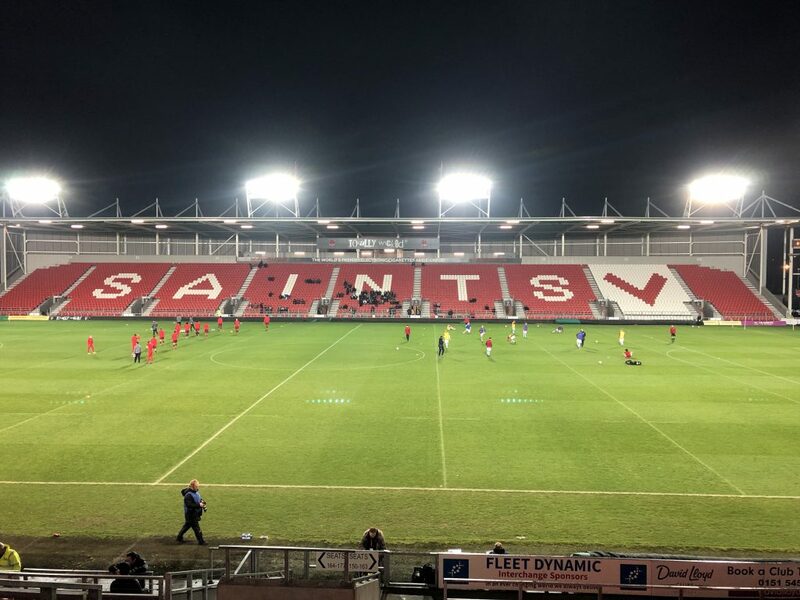 After spending the first few months of the course honing their skills in tutor-led industry focused workshops, Dan Brown and Ryan Warren took their seats at the Totally Wicked Stadium in St Helens to report on a comfortable 4-0 win for the Reds’ U-18’s. 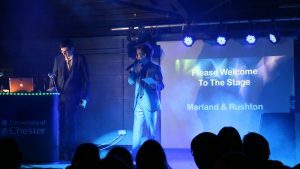 After gaining media accreditation via Liverpool Football Club’s press office, Dan and Ryan covered the game live from the press box where they rubbed shoulders with professional sports journalists including the Liverpool Echo’s LFC correspondent James Pearce. The students put into practice writing skills developed on the first year Sports Writing module that is delivered by senior lecturer and Eurosport journalist Paul Hassall. 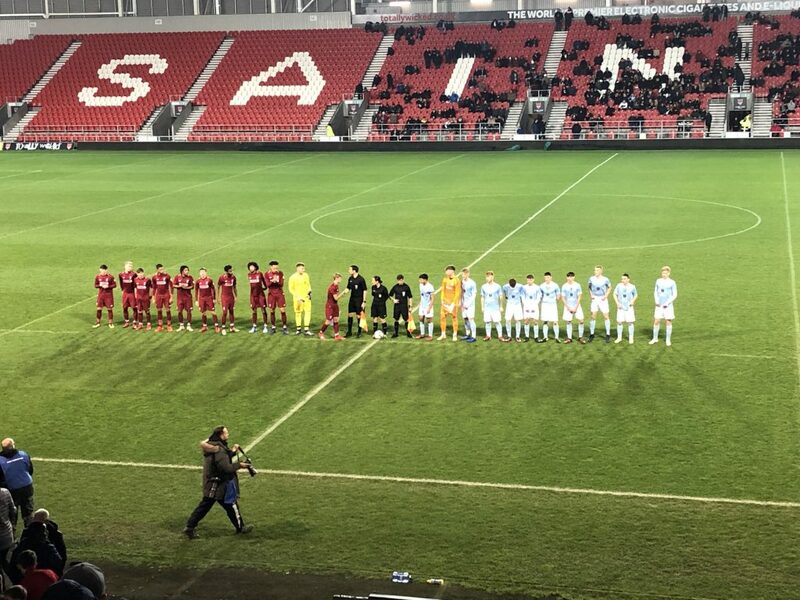 Paul Glatzel caused havoc as his hat-trick helped Liverpool U18s progress to the fifth round of the FA Youth Cup with a 4-0 win over Accrington Stanley U18s. 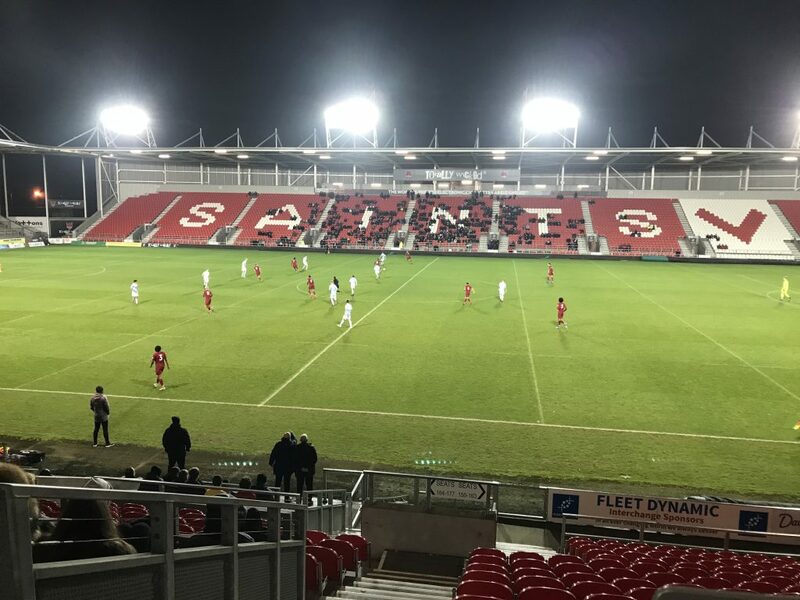 Glatzel’s hat-trick and a header from Rhys Williams proved too much for Accrington on a bitterly cold evening in St Helens. 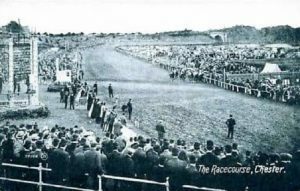 Liverpool came into the tie off the back of a stoppage time winner in the 3-2 victory against Portsmouth, whereas Accrington scored two in extra-time against Leeds in a 4-2 win in the third round. The onus was on the Liverpool players to impress, in the hope that they can follow their U18 teammates Rafael Camacho, Curtis Jones, and Ki-Jana Hoever in claiming a spot in Jurgen Klopp’s senior squad. The first big opportunity of the game fell to Accrington as a Lewis Gilroy cross was deflected into the path of Charlie Ridge, who could have stunned the hosts with the opening goal, but his effort sailed over the bar from close range. Liverpool’s dominance in the first 20 minutes lacked the clinical edge as Abdi Sharif couldn’t convert a testing cross from left-back Yasser Larouci. Centre-back Rhys Williams opened the scoring as he headed a pin-point cross from Leighton Clarkson past Accrington goalkeeper Toby Savin. However, Accrington threatened to equalise immediately as a Mitchell Nolan pass played in Gilroy, but his effort was saved well down low by Liverpool keeper Vietzslav Jaros. Accrington’s Harry Perrit was the only player to be yellow carded as referee Amy Fearn penalised him for a nasty challenge on Reds’ skipper Glatzel. Glatzel doubled the young Reds’ lead with his 18th goal of the season after he headed in a Larouci cross from the left. It was an impressive first half display from Liverpool who took a well-deserved 2-0 lead into the break. Accrington returned for the second half fired up, and threatened more than they did in the first period. Ridge did well to get past Larouci but could only fire his shot straight at Jaros. After some intricate interplay from Larouci and Bobby Duncan, Duncan then set up Glatzel who rounded the keeper to grab his second of the game and Liverpool’s third. Glatzel secured his third hat-trick of the season late on as he capitalised on a defensive mistake to round Savin again and slot the ball away. Liverpool will now face Wigan Athletic in the fifth round of the FA Youth Cup on the weekend of February 9. 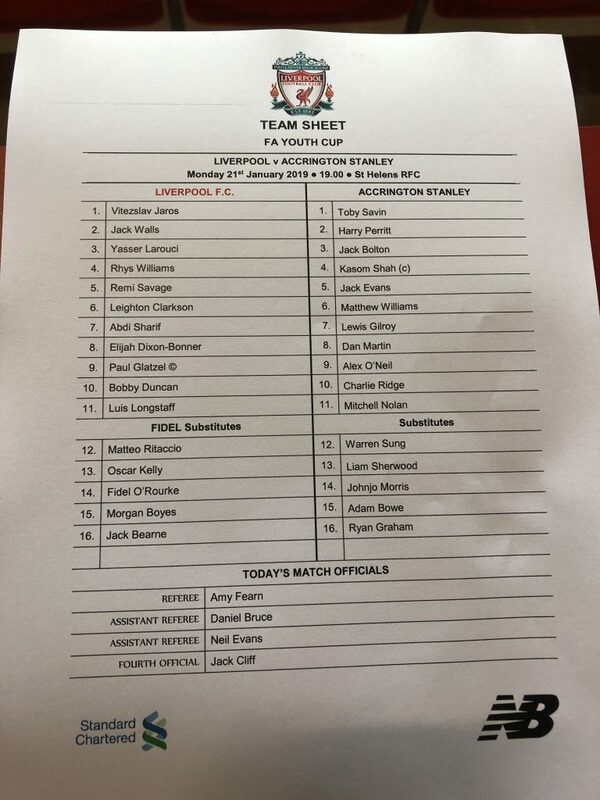 Paul Glatzel stole the show as Liverpool progress into the last 16 of the FA Youth Cup after a routine 4-0 win against Accrington Stanley. First half headed goals from centre-half Rhys Williams and skipper Glatzel saw Liverpool go into the break with a comfortable 2-0 lead. Glatzel then grabbed his second and third of the game as he rounded the Stanley keeper twice to seal his hat-trick with his 20th goal of the season. Liverpool went into the game knowing a win would extend their unbeaten streak to six games and grant them a place in the fifth round. Accrington created the first opportunity of the game after a clever ball from Lewis Gilroy provided Charlie Ridge with a great opportunity to open the scoring. 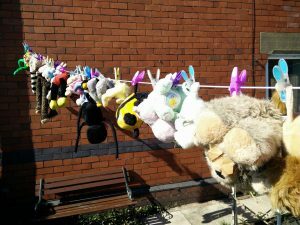 The effort was rushed however and went high over the bar. Liverpool soon took control and broke the deadlock when Williams got onto the end of a Clarkson delivery from the right. The defender’s cross was met by a powerful header from Williams. The Reds doubled their lead on the stroke of half time when Glatzel leapt the highest to convert a header after a brilliant Larouci delivery; the defender beat two men and whipped in a beautiful ball that Glatzel made sure of. Liverpool started the second half as they ended the first and should have made it 3-0 when Larouci delivered yet another outstanding cross into the box. This time a diving Duncan header somehow bounced off Savin in the Accrington goal. The away side continued to compete and could have pulled one back when Alex O’Neill headed straight at Vitezslav Jaros in the Liverpool goal after a good ball from Ridge. This proved costly for Accrington as Lewtas’ side scored a third after some great work from Duncan on the left delivered a sensational through ball that found frontman Glatzel who, aided by a slice of luck, rounded the keeper to slot into the open net. It did not take Glatzel long to grab his hat-trick after he once again rounded Savin to make the most of a defensive mix up to seal the game. Liverpool will now face Wigan in the last 16 of the FA Youth Cup.